First Line:"The Ala had gone to the library in search of hope." 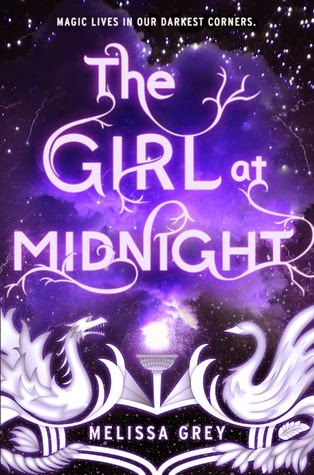 Review: The whole time I was reading The Girl at Midnight I couldn't help but think that it reminded me so much of The Daughter of Smoke and Bone except The Girl at Midnight was a little less developed if that makes sense. Not to mention the book was lacking in the description department, when I read I like to be able to picture everything in my mind detail for detail and it was all just a little...blurry. So we have Echo who ran away from home at a young age and was living in the library when she is eventually discovered by "The ALA" who is part of an ancient race of beings called the Avicen who have feathers for hair and reminds you of birds and they are at war with a race called the Drakharin who are part dragons or in this case they look human but have scales. Echo is a modern day pickpocket except she has the advantage of using this magical dust that creates portals to all over the world, eventually she steals something that leads her to go on a mission to find the mythical Firebird the one thing that can end this war between the Avicen and the Drakharin. There were multiple point of views but the only two point of views I really cared to read were Caius and Echo's, theirs contributed most to moving the plot along. And not to mention I found them both to be the most interesting, Echo is sarcastic and loyal and I found myself laughing a few times with her point of view and as for Caius I just really like complex characters and he has many layers to him, half the reason I'll be considering picking up the next book is mainly because I want to get to know him better. As for the romance I'm not really feeling it right now since it wasn't really that developed and I can see a love triangle happening in the next book which I'm kind of dreading already. Overall I found The Girl at Midnight to be an easy and at times a predictable read. The series has great potential with quite a few interesting characters if only they were just fleshed out a little bit more. ~"Sometimes," the Ala said, "when I'm feeling sad, I like to be around all these books. They're very good at making you forget your troubles. It's like having a million friends, wrapped in paper and scrawled in ink." ~"Well, maybe it's time the dreamers started calling the shots."